Science, Technology and Society are inextricably interwoven terms, for science and technology impact society in a definitive manner, which makes it imperative to study relationship between these three terms. The progress being made in the field of science and technology in present times is phenomenal. It, therefore, becomes all the more important to study the relationship between science, technology and society which has been attempted in this seminar proceedings. The book contains articles of leading scientists and experts in the field of space, atomic energy, electronics, communications, health, defence, education, water, etc. Thus, it has the unique advantage of very authentic accounts of the national scenario by those who are at the helm of affairs in these matters in India, both in the government and private institutions. Science, Technology and Society are inextricably interwoven terms, for science and technology impact society in a definitive manner, which makes it imperative to study relationship between these three terms. The progress being made in the field of science and technology in present times is phenomenal. It, therefore, becomes all the more important to study the relationship between science, technology and society which has been attempted in this seminar proceedings. This seminar proceedings highlight the fact that while India is poised for a healthy economic growth in the coming years and decades, both the urban and rural societies are facing series of problems which will become more acute in future. This is more so with regard to water, power, health services, education at various levels, environmental concerns, pesticides contamination in water and food products, communication, transportation, national and international security and so on. It also provides a comprehensive and authentic account of the efforts that are underway to mitigate these problems through the use of science based high technologies. 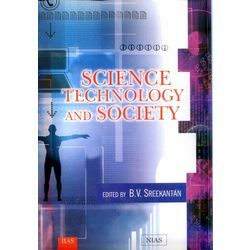 The topics covered in this book are: Applications of Space Technology Genetics and Biotechnology Health and Medicare Education Higher and Technical Environmental Concerns New Technologies High Tech Electronics, Communications, IT Applications of Nuclear Technology Energy Options and Alternatives The book contains articles of leading scientists and experts in the field of space, atomic energy, electronics, communications, health, defence, education, water, etc. Thus, it has the unique advantage of very authentic accounts of the national scenario by those who are at the helm of affairs in these matters in India, both in the government and private institutions.